I did it because my nephew turned seven. I am not seven; I am forty-two. However, I did go roller skating since he was turning seven and his mama and I got roller skates on our feet and it made us feel like we were seven. We held hands and went real fast. When we got to the curve in the rink, I said “Whip me around the corner,” at which point she attempted to stand still (on skates) and whip me. While I went whipping around at somewhere near the neck-breaking speed of 0.5 mph, her body realized that standing still on skates doesn’t work so great (especially when you’re past the age of seven) and she went down. I let go of her hand as she was going down and in the process of correcting my balance, did a few leaps and spins in the air. But, alas. My balance didn’t correct itself and my forty-two year old body went down sideways. When you have wheels on your feet and said wheels fly out from under you, there’s not a whole lot you can do to break the fall. The brunt of the force was taken by my left forearm. As I was still in the air, on the way down, I heard my sister-in-law yelling “THIS IS WHY I DON’T HANG OUT WITH YOU!” And then I hit the rink and I felt my neck snap sideways in slow motion. And then we stayed there, sprawled out exactly as we fell, laughing and laughing, while employees skated over to make sure we were okay. Okay is a relative term but yes, we were okay. 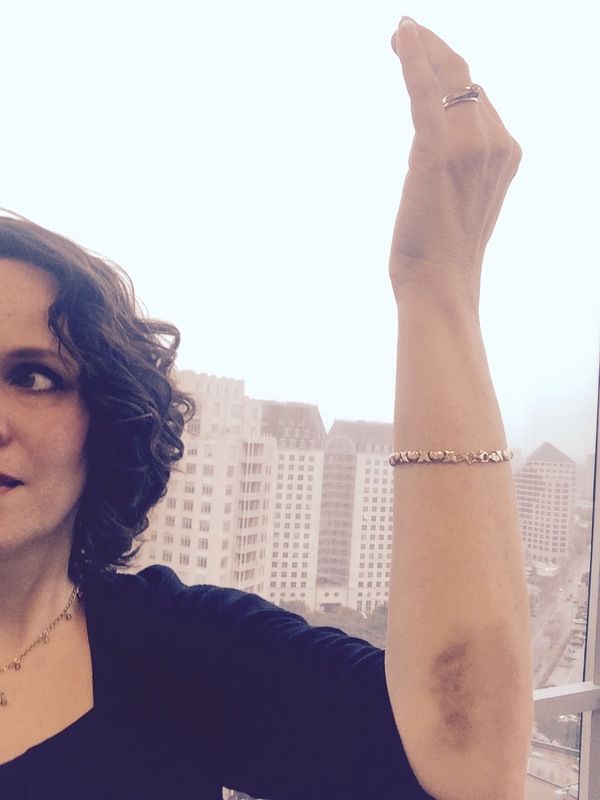 And now I have this super cool bruise and a not-so-cool sprained feeling in my wrist to show for it. And I sit at my computer at my desk at work and answer some 500 emails per day with said sprained wrist. Yes, I exaggerate. But not much. And to top it off, this morning I went into my daughter’s room to turn off her lights that somehow never turn themselves off. One of those lights is on the far side of her bed and the only way to get to it is by navigating the obstacle course that masquerades as a floor. I gave it my best shot and somehow managed to step on both the computer and the cat at the same time, as they both hid there among all the clothes, shoes and makeup. As the cat [noisily] alerted me to his existence, I flew forward onto the bed, catching myself with….. my sprained left wrist. All I have to say now is ouchiewawa. But don’t I have a lovely view from my office on this beautiful rainy day? I know it’s been a long, long time since I last wrote here. Sometimes people ask me about it. I always say that I think I’ll write again someday but not today. I guess someday is here, although this seems like a very odd post to come back with. Maybe it will be my last, in which case it seems like a very odd post to end with.